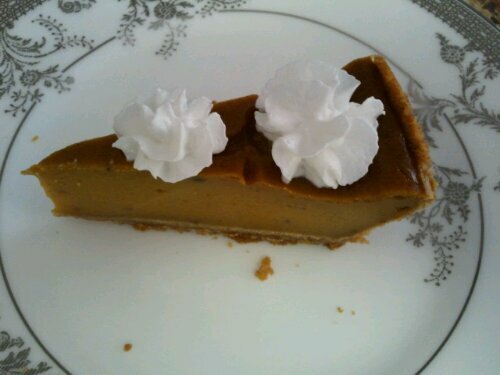 For Vegan Pumpkin pie number two I really wanted to amp up the flavors that make a pumpkin pie so special. So the pumpkin takes a more starring role, and the spices get kicked up a notch. Thomas thought a graham cracker crust might be nice, so we took the Arrowhead Mills one for a test drive. It does double the calories and is more than five times the fat of the actual pie though, so if you’re trying to keep it skinny, try baking it in a pie dish or in individual servings in ramekins sans the crust. I saw it done with a pie recipe before and it seemed to turn out well… however, I have not tried it out myself, so please let me know if you do! PS – This recipe is perfect for doubling! 3. Pour into pie shell and bake for 15 minutes. Drop temp to 350° F and bake for 50 minutes. Remove from oven to cool for 30 minutes, and refrigerate for at least 4 hours, or overnight. Top with whipped topping (if using) before serving, and enjoy! * Basically, we’re replacing 2 large eggs here. So 1 tbsp. agar = 1 egg / 2 tbsp. arrowroot or cornstarch = 1 egg. Feel free to play with the substitutions depending on availability. I ordered the agar powder on amazon.com. Whole Foods and other grocers carry Arrowroot. 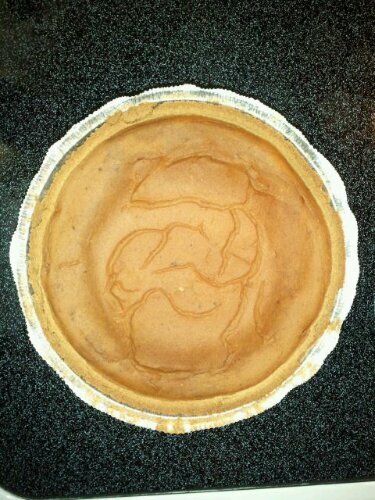 Results: We ate this pumpkin pie in two states. First, about 40 minutes after coming out of the oven because we couldn’t wait, and it was a delicious, warm, custardy mess. And second, the next day, in its fully firmed up state, perfectly sliced and topped with soy whip. Let me tell you, that graham crust was a SUPERB idea! It complements the flavors perfectly. This is a super firm, perfectly spiced pumpkin pie filling that is remarkably low in fat and calories. After several tastings, I did decide that this is probably too firm though, so I will leave out the arrowroot, and try halving the agar. If you try it, please let me know what you think. I’m baking four of these for Thanksgiving next week! Final nutrition facts will vary depending on what type of pie crust you use!